Archaeology Online features archaeological web sites, excavations, field schools, books, reviews, and where to find archaeology on the Web. 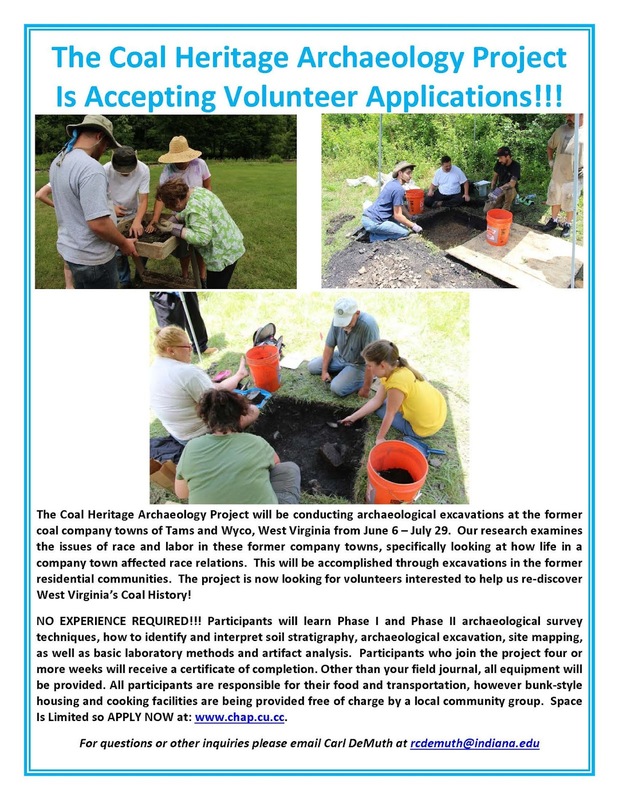 The 2016 Coal Heritage Archaeology project is being led by Carl DeMuth (MA, ABD) in West Virginia's southern coal fields. Our excavations will focus on the towns of Tams, WV and Wyco, WV (the majority of the focus will be on Tams). These towns sit along the Raleigh County/Wyoming County border. Both of these towns were formerly owned and operated by WP Tams Jr. They are significant because WP Tams wrote a memoir about running coal towns, meaning that they are some of the most well documented company towns in Appalachia. Fieldwork during 2016 is currently scheduled for June 6 to July 29 of 2016. Volunteers do not have to dedicate to participating for all 9 weeks, but those who commit to at least four weeks will receive a certificate of completion. During the week we will be staying at the Mullens Opportunity Center in Mullens, WV just a short drive from both field sites. The MOC is providing housing for the students. While the organization will not be charging participants for housing, donations are strongly encouraged (and tax deductible). The MOC has ample kitchen facilities, showers, and high speed wireless internet. Students are responsible for food, transportation, a field journal, and incidentals, but field equipment will be supplied. Anyone under the age of 18 must be accompanied by a parent or guardian. The project runs from 8:30-4:30 Monday through Friday. On weekends volunteers are free to do as they wish. We will be staying near the New River Gorge which offers some of the outdoor adventures in the mid-Atlantic. (Whitewater rafting, rock-climbing, mountain biking, etc). On rainy days we will do laboratory work, cleaning and analyzing the material recovered in the field. There is also the potential for museum visits if heavy rainfall is experienced. The Snyder Site Complex consists of multi-component prehistoric localities situated on landscapes adjacent to the Delaware River in the river basin’s mid-section. The oldest of the occupations (Paleoindian cultural period), date to approximately 13,000 years ago in New Jersey. Over 30 fluted Paleoindian projectile points or bifaces have been reported from plowed/surface and buried, stratified contexts. 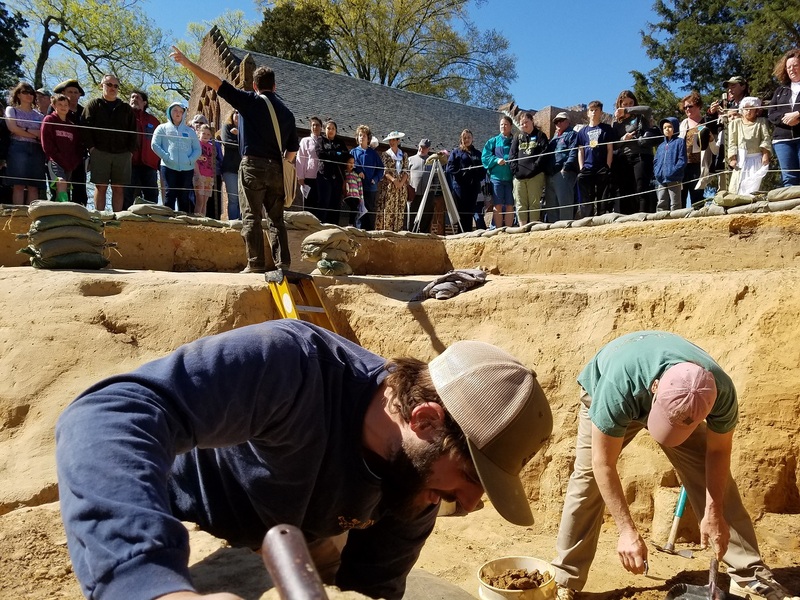 Jamestown’s Field School provides a unique opportunity for students to make a contribution to the research and interpretation of early 17th-century English-America. The Field School, jointly offered by the Jamestown Rediscovery Foundation and University of Virginia’s College of Arts and Sciences, introduces participants to the methods and theories of American historical archaeology through hands-on fieldwork on the site of James Fort (1607-1624). Over the course of the Field School, students will learn excavation and recording procedures as well as how to identify and interpret 17th-century European and Native American artifacts. The Field School will include field trips and weekly seminars exploring recent contributions of historical archaeology to colonial history, new methods in field recording and interpretation, and a survey of the recent literature in the discipline, including new publications by the Field School director and senior staff. Both untrained and experienced students will learn practical archaeological skills and the course is also an excellent educational opportunity for teachers seeking re-certification in the social studies content area. For more information on applying to the field school, go here. 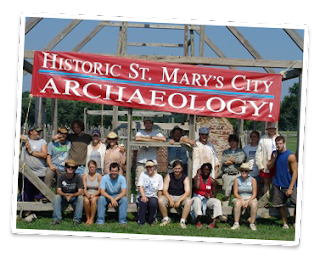 Historic St. Mary’s City (HSMC), in association with St. Mary’s College of Maryland, announces its 2016 field school in historical archaeology, May 31st to August 6th, HSMC is a state‑supported, outdoor museum located at the site of Maryland’s first capital (1634-1694). The main focus of this summer’s excavations is on the yards directly adjacent to the Calvert House. Built in the first decade of Maryland’s settlement by Leonard Calvert, the first Governor, it served as the statehouse of the Province until 1676. Previous testing in the back yard revealed the presence of numerous fences, borrow pits, several outbuildings and the ditch of a 1645 fort. Excavations will seek to better define the fences, identify outbuildings, and explore selected features to aid in dating the development of this landscape. 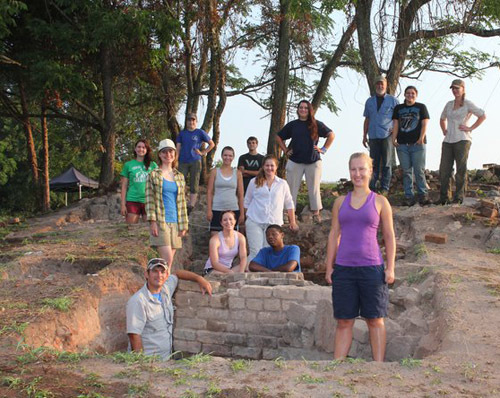 For the student, the program is an intensive, 10 week experience in Colonial archaeology. The first week includes lectures on history, archaeological methods and material culture studies. Students learn artifact identification by working with one of the best archaeological collections of 17th-century, Colonial material in the country. During the following weeks, students participate in excavation, recording and analysis. Guest scholars speak on the history and architecture of the Chesapeake region. Field trips to nearby archaeological sites in Maryland and Virginia are planned. Students will also have the rare opportunity to learn about and help sail the MARYLAND DOVE, a replica of a 17th‑century, square‑rigged tobacco ship. 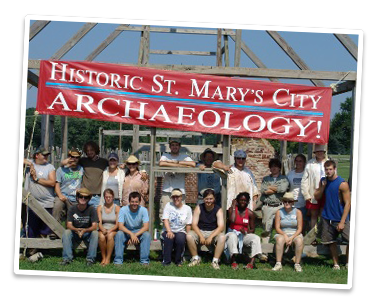 The HSMC field school is designed for students in American Studies, Anthropology, Archaeology, History, and Museum Studies. Students may register for either Anthropology or History credits. Prior experience or course work is not required. The ability to engage in active physical labor is essential. A total of eight (8) credit hours are offered through St. Mary’s College of Maryland, a state honors college dedicated to the Liberal Arts. The program costs $1560 which covers tuition. There is a $60 fee to cover the cost of the major field trips. Housing is available at a reduced cost through the college. Transportation, food and entertainment are the responsibility of the student. HSMC is located two hours south of Washington, D.C. in Southern Maryland. The first innovation and development of alkaline-glazed stoneware pottery in America occurred in the Edgefield District of South Carolina in the early 1800s. It remains an enduring mystery as to how these new ceramic methods were developed in that place and time, and how the techniques of clay choice, temper, and glaze developed over the following century. These potteries employed enslaved and free African-American laborers in the 19th century, and the stoneware forms also show evidence of likely African cultural influence on stylistic designs. Edgefield potteries thus present fascinating research questions of understanding technological innovations and investigating the impacts of African cultural knowledge and racial ideologies on a craft specialization during the historic period in America. This project entails an interdisciplinary, collaborative, and archaeological study of the first development in America of alkaline-glazed stoneware pottery forms, the development of that South Carolina industry over time, and the impacts of racism and African cultural influences on those processes. This project seeks to undertake detailed archaeological investigations of principal sites in Edgefield, conduct archival research, and start a multi-year community engagement and education program related to these subjects. Archaeological field schools and research teams at such pottery sites can explore both the production facility remains and the residential sectors for the enslaved and free African-American laborers. Primary research questions include: (1) examining the distribution of work areas and residential locations in each pottery site and analyze the degree of spatial segregation due to the impacts of slavery and racism; (2) understanding differential uses and development of those work and residential spaces, as reflected in archaeological features and artifact distributions, and the degree to which variations correlate with different racial categories associated with the occupants; (3) analyzing faunal and botanical remains to explore and contrast dietary and health patterns between residential sites and the degree to which variations correlate with different racial categories associated with the occupants; and (4) understanding the development and changes over time in the technologies of pottery production at these three manufacturing sites. Join us at the Pottersville site for archaeology in the summer of 2016! We return for another season of field research on the amazing heritage and history of Edgefield pottery production. Students and volunteers will work in supervised teams, learning to uncover the archaeological record as members of an investigative team, with skills employed by professional archaeologists. You receive training in the techniques of excavation, mapping, artifact classification, and contextual interpretation. Laboratory processing and analysis will also be ongoing during the field season. 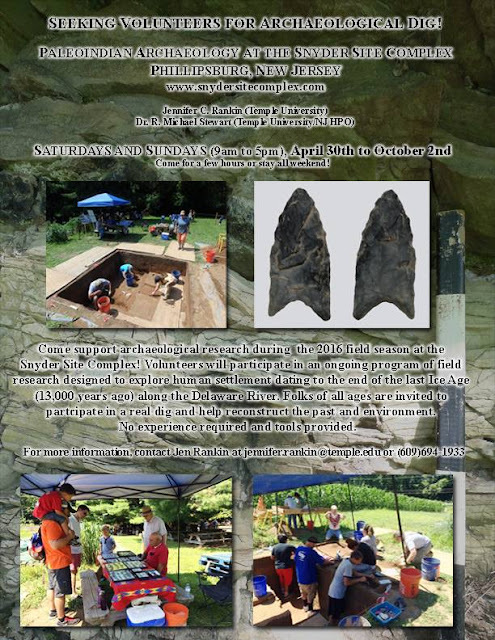 Evening talks by project staff, visiting archaeologists, and historians will focus on providing background on how field data are used to answer archaeological and historical research questions. Lodging will be provided at the beautiful Edgefield Inn. Mr. Bettis Rainsford, the owner of the Inn, has been incredibly supportive of our archaeology projects and provides rooms at a fraction of the usual rates for this elegant hotel. Download an application form here.